I went out one evening to a church event. Jason, the hubbs, had to do the bedtime routine. Including giving him a bottle (of pumped breastmilk). He went through the whole thing I do. The mobile gets turned on, singing to some songs, a lavender lotion massage, a bedtime story, fed him the bottle, etc. Well, that night he woke up after a couple hours only. And from there it has been pretty regular. Except for another 3 or 4 day spread of going from about 10-4/4:30. Mostly he is up every 2-3 hours at night again. I am not a tough love parent. I hate hate hate that method. It hurts my heart and his heart to let him cry it out. I just think it is awful. I feel as if I am losing his trust because he is in that dark room all alone, scared, or whatever his need is. I firmly believe you cannot spoil a child with too much love. My husband would have it another way if he could. He is a tough love parent. But, being the control freak that I am, there is no way that I allow that to happen. I promptly freak out if I find out that he let Jackson cry for too long. But part of me wonders, does he just do it because he wants me to be by him? He sleeps in his own room. As soon as I enter his cries stop. He knows. He knows I am his monkey, as Jason calls me. Monkey Mommy. So Monkey Mommy does what he wants. And usually every few weeks in the middle of an exhausting night, I have a small breakdown. I swear I can’t do this. That I am exhausted. I need more help from Jason. Etc. Last night was one of those nights. I always feel incredibly guilty for having these feelings. That I just want a break. I don’t want to be a mom at that moment. I want to be lost in sleepville, dreaming away about something ridiculous, under my warm sheet and blanket in my soft bed. And when I “wake up” for the day, after countless attempts at getting him to stay asleep, I feel just guilty. That I am awful. I know I am not, really. I am having a normal human response to lack of sleep. To being a new momma. It is the most difficult job I have ever had. But a part of me just feels terrible for feeling so put out. What can you do? I have heard about how guilty moms are always feeling. I never understood it until now. Working mom, SAHM, I think it makes no difference. I think that either way every day you are going to be dripping in some sort of guilt. Always doubting how great of a mom you are, judging yourself. Thinking, “well, his diaper was REALLY soaked this time. Will this lead to some bathroom issues 25 years down the road.” Or “Tummy time wasnt a total of 30 minutes today, will he be developmentally behind forever now?!???!?! ?” You can insert some ridiculous thought into either of these quotes. These thoughts tend to be off the wall and absolutely ridiculous. They are unfounded and it is just a mom doubting herself because she is responsible for a human being. I try to not compare what he does to what other babies are doing. I really do. He is his own person and he will do things on his own time. He is 16 weeks and already is scooting. There is a tooth coming in. I can see and feel it. He has been socially smiling in response to us and funny faces since he was 2 months old. 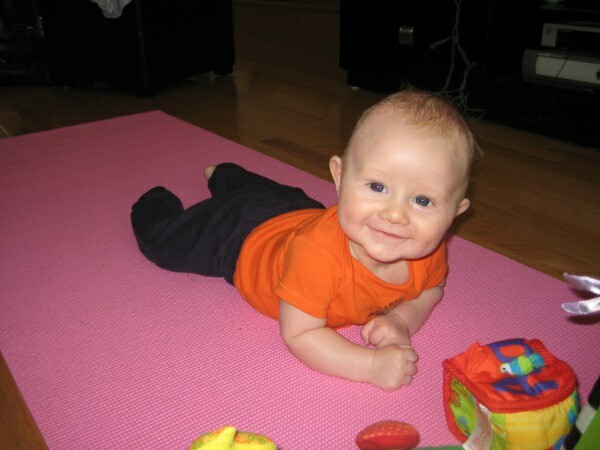 He has been regularly rolling from tummy to back since he was about 2 1/2-3 months. He almost has back to front rolling mastered. He can roll himself all over the floor by wiggling from back to side, but just doesn’t quite get all the way over yet. He does a lot of things ahead of his time. I only know this because of the emails I get from all these parenting sites explaining what baby should be doing. When I read the for the current time I often realize he has been doing that thing for a while prior to “this week/month.”But at the time it just seemed that it was a normal milestone he was hitting. He should smile, he should laugh, he should roll over etc. All babies do this at some point or another. That is him, that is his personality, that is how he is as an individual. I need to remember that not sleeping at least 5 hours a night also falls under that category. That is just Jack. But part of me feels a twinge of jealousy every time I hear about how some younger or even old baby is or has been sleeping through the night. WHY CANT HE DO THAT SO THAT I GET SOME SLEEP? That is what I think. I quickly try to scold myself. If I don’t want to compare him to other babies when it comes to all of the things I consider positive, then I have to apply that to this area. I cannot place these things into different categories. I have to remain consistent if this is my parenting method. He is a great baby. He is rarely fussy and doesn’t scream often. Almost to the point that when he DOES start crying and I cannot quickly fix it, I start to panic. I don’t know how to handle it. That is how often he is in a bubbly happy mood. So overall I have little to complain about. I am blessed. He came out of me with wide eyes, smirked at his dad, flashing his priceless dimples, and then realized what had just happened and the crying began. THAT is how happy of a baby he is. But I am tired and so this is MY hissy fit! I WANT TO SLEEP. And now I will be good for a couple more weeks until my next 3 am meltdown when I am finally overly exhausted. After all, how can you be upset when every day you wake up to this baby?? ?